International Plastics is an ISO 9001:2008 certified manufacturer. This "Pack and Ship Superstore" has the lowest prices for wholesale plastic bags backed by their guarantee. The other packing and shipping supplies are discounted and have better quality with lower prices than most other suppliers. International Plastics accepts small and bulk orders, plus one has the option to have these customized such as placing a logo or text and/or customize the size and this will be done to suit your requirements, backed by a 100% satisfaction guarantee. 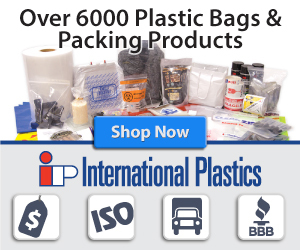 Ordering online from International Plastics does have advantages aside from the up front savings because of the low prices, this packaging, plastic bags, and shipping supplies websites has a large inventory of over 6,000 items. If the purchasing of the plastic bags, packaging, and shipping supplies for your company is often and you would like to save on this expense, using a wholesale website like International Plastic can save you more than just pennies a day as it can be big bucks that is saved. You may find out how low the prices are for your requirements by visiting the website and requesting for a quote. Have you used the International Plastics? Share your review!